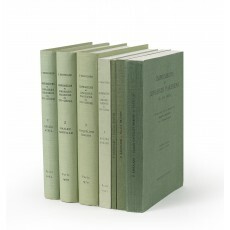 Seven volumes (28 cm), I (1964): lxxi (1), 374 (4) pp., 48 leaves of plates. II (1969): liv (2), 523 (5) pp., 40 leaves of plates. III (1969): xlvi (2), 724 (4) pp., 46 p. of plates. V (1991): xlii (2), 362 (4) pp., including 34 p. of illustrations. [VI] (1982): 113 (15) pp., including 8 p. of plates. [VII] (1984): 238 (18) pp., including 12 p. of plates. [VIII] (1986): xxxiii (3), 522 (4) pp., with text illustrations. Uniform publisher’s green cloth, lettered, original glassine jackets (vols. I-III); publisher’s printed wrappers (vols. V-VIII). - A biographical dictionary of all the members of the Parisian book trade whose names can be discovered, accompanied by a catalogues of the books with which they were associated. “The finished work will be one of the great monuments of bibliography” (from a review by Nicolas Barker of volume I, in The Book Collector, Winter 1965, pp.547-555). Not present here are parts [IV] Fascicule: Binet – Blumenstock (Paris 1986) and [IX] Fascicule: Jean Loys, compiled by Marie-Josèphe Beaud-Gambier and Sylvie Postel-Lecocq (Paris 1995). ¶ Fine copies. 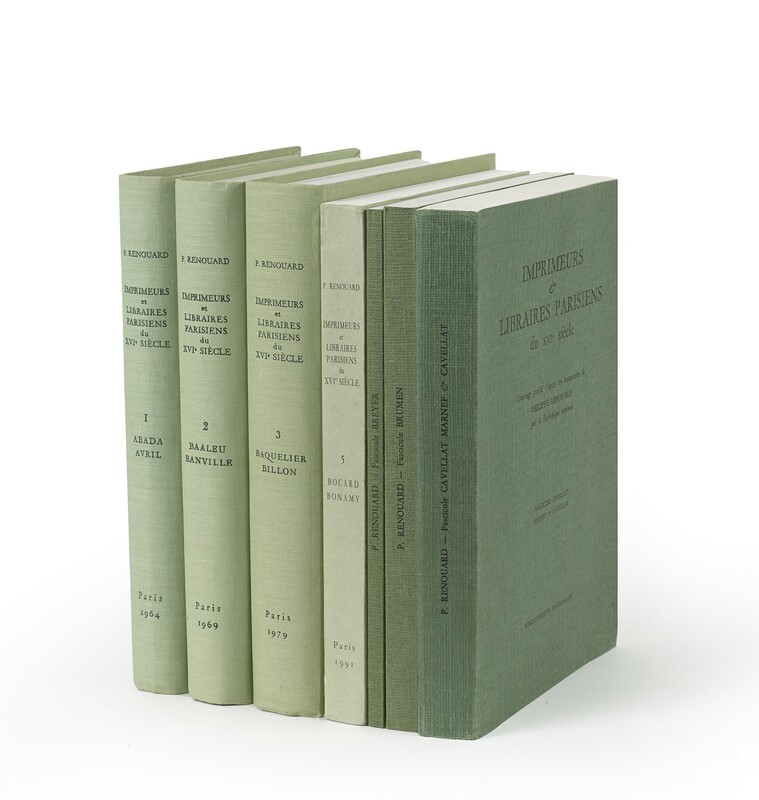 Three volumes (27 cm), I (1964): lxxi (1), 374 (4) pp., 48 leaves of plates. II (1969): liv (2), 523 (5) pp., 40 leaves of plates. III (1969): xlvi (2), 724 (4) pp., 46 p. of plates. Publisher’s cloth bindings, publisher’s glassine jacket. ¶ Fine copy. (27 cm), xlii (2), 362 (4) pp., including 34 p. of illustrations. Publisher’s printed wrappers. ¶ Fine copy. (27 cm), 113 (15) pp., including 8 p. of plates. Publisher’s printed wrappers. ¶ Fine copy. (27 cm), 238 (18) pp., including 12 p. of plates. Publisher’s printed wrappers. ¶ Fine copy. (27 cm), xxxiii (3), 522 (4) pp., text illustrations. Publisher’s printed wrappers. - Lists 604 editions from the period 1547-1600. ¶ Fine copy.